Check the power on the printer is switched on. Check that the communication cable (USB, parallel, serial, Ethernet etc.) that connects the printer to your computer or network is connected at both ends. Check the printer itself for any error messages that may be displayed on its LCD screen or the colour/flashing status of the LED light. Click here to view information on Zebra desktops status lights or view your printers manual for more information. Check that the correct communications port has been selected within the driver. a) It will present the found new hardware dialogue (windows XP or older only) requesting you to reinstall the driver. Alternatively it will automatically install the printer again (Windows Vista, Windows 7 and sometimes Windows XP). Both cases will create a duplicate driver. At this point you can either resume using the new driver (preferably deleting the old driver if possible), or attempt to connect the printer to the right USB port on the computer (usually requires trial and error until the old printer driver displays an ‘Online’ status in the printers and faxes window). b) If a port already exists for the USB port that you have plugged the printer into, it will not display the found new hardware wizard, and if you have tried to print you will be notified that the print failed. In this case all you need to do is try the other available USB ports within the ports list of the driver until a print job will print. 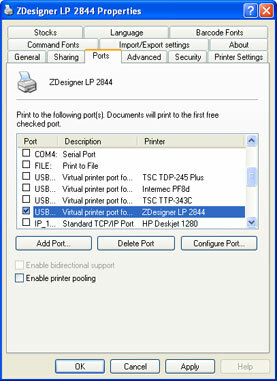 To do this within the ports screen (see right) select another USB port and click the Apply button (and OK when it works). In the case of a WLAN or LAN connection, attempt to ping the printers IP address from the command prompt to see if the printer is visible from the network. If it is, ensure that the port settings are correct within the driver (i.e. that the right port is selected and that the correct port has the correct IP address setting).